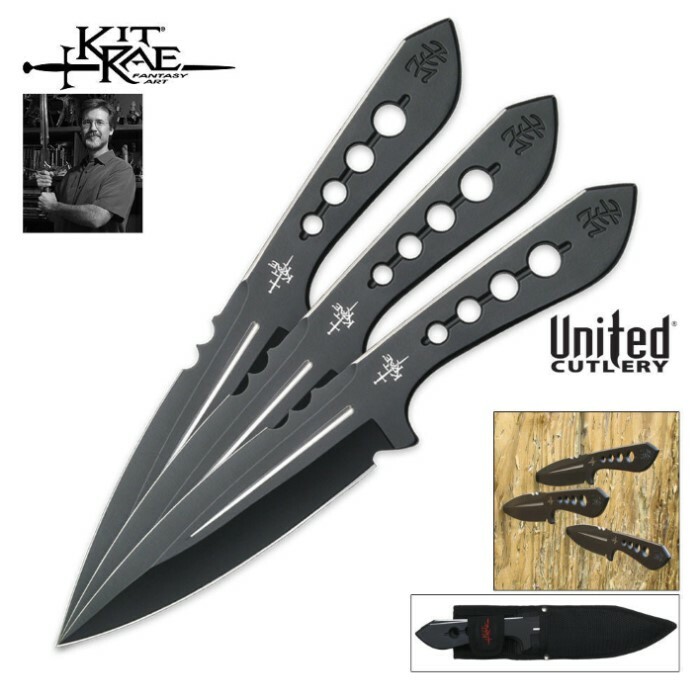 Well known for his fantasy sword and knife concepts, Kit Rae is also an avid throwing knife and axe enthusiast. So it is no surprise that he has perfected new throwing knife designs. Full sized and designed for long range throwing, these knives have a sleek, tactical look and feel. Constructed of one solid piece of AUS-6 stainless steel and finished in black. Each knife has been balanced for spot-on throwing. Includes a nylon belt sheath for carry or storage. Each set also includes a paper throwing target. 10 3/8 in. overall, 5 1/2 in. blade. Weight: 6.5 oz. Each. 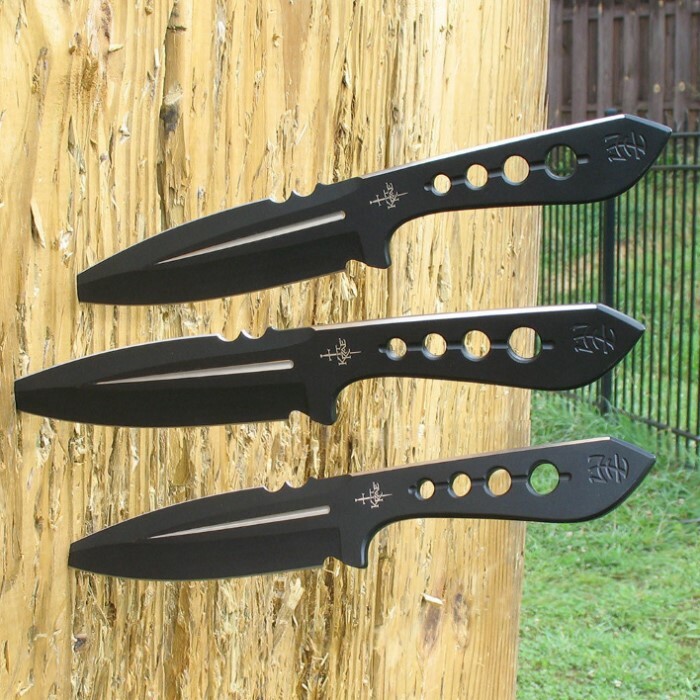 These knives are balanced really good, feel good to throw and I recently started throwing no spin and these are my favorite knives that I own for no spin, they feel good leaving your hand when you throw them this way. Great knife to add to my collection. Excellent knives, and just the right size. Heavily made, yet seem to be very well balanced. As heavy as they are, they should have great penetration. The sheath is also well made. I would purchase this set again. These throwers are awesome. Each knife has a distinct fantasy vibe to them. The tip is sturdy enough to not bend easily, while still being sharp enough to penetrate tough targets. Great for mid to long distance throwing. All in all, these are one of my favorites to use. A great by for any knife thrower. I'm very happy with the size and weight of these knifes. They are well balanced and rotate consistently with good penetration.